They mann classrooms in public schools, serve as extension workers in Primary Health Centres and act as Agriculture extension Advisors to farmers. It is why we are pleased to announce that the N-Power Impact Series Competition will commence on Tuesday, November 13th at 23:00 hours. This competition is a reward package for outstanding N-Power volunteers who have impacted their communities. Kindly note that this is different from the Enhanced N-Power we discussed earlier. We will share information on this later. The programme has over 500,000 graduated and non-graduate volunteers spread around 774 local Government Areas in Nigeria. The volunteers of the programme are manning classrooms in public schools, serving as extension workers in public primary health centres and acting as Agricultural extension advisors to farmers. Each beneficiary is equipped with an electronic device pre-loaded with over 1 million resources useful for training in communities and for self-development. 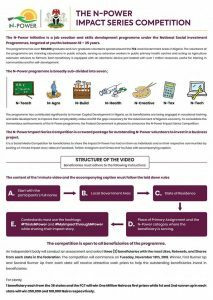 The competition is open to all beneficiaries of the programme.